On June 23rd, 2015 Warner Bros. released Tom and Jerry: Spy Quest. As I recently mentioned, we love watching mysteries as a family. I just feel like it helps keep the little one's brains working throughout the summer, besides actually enjoying them. When I heard Warner Bros. Home Entertainment was combining Tom and Jerry with The Adventures of Jonny Quest, I knew it would be a new fun DVD for the family to watch together. 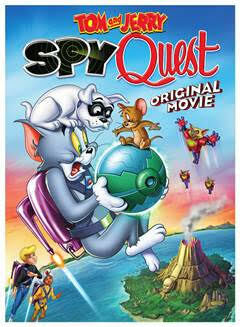 The synopsis says "Tom and Jerry set out on one of their biggest, boldest adventures yet in Tom and Jerry: Spy Quest. Get set for intrigue, thrills, suspense and high-action as the animated duo get wrapped up in a top secret, spy-tacular, fun-filled mission the whole family can enjoy together. It’s just another day at the beach for the dueling Tom and Jerry…that is until they bump into world-class junior spies Jonny Quest, Hadji and their canine companion Bandit. When longtime Quest family nemesis Dr. Zin discovers that Jonny’s father, Dr. Benton Quest, has a device to solve the world’s energy problems, he sends his evil cat army to steal it and capture him and his bodyguard, Race Bannon. Jonny and his new furry friends set out on an action-packed quest to find his father and save the world from the malicious Dr. Zin." Recommendation: I think that it is definitely worth the cost if you've watched either of these show in the past and the quality is as good as ever! Kevin and the boys gave this a thumbs up all around. Giveaway: Warner Bros. is going to give one of A Lucky Ladybug's lucky readers Tom and Jerry: Spy Quest DVD of their own! We love to go on nature walks! We have explored a new park and a few old favorites so far. We just love being outside, even in this heat! We have gone to the boardwalk to go on the rides and just went to a Monster Truck Show on Father's day! I love the giveaways and the recipes on your blog. I took my son to the movies to see Jurassic World yesterday. We love to go on hikes in the summer. We also have got some chicks for the kids to raise. Its been lots of fun. THank you! We enjoy going on nature hikes to see how many plants, animals, bugs, etc., we can identify. My twins and I have been doing geocaching in our nearby parks.